Part Set and Full Set suites. 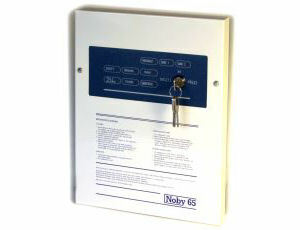 The Noby-65 is versatile intruder alarm control panel suitable for domestic and small commercial installations. It features as standard two alarm zones together with dedicated loops for Water Sensors and 24V Smoke Detectors, with separate siren outputs available for Fire and Intruder alarms. 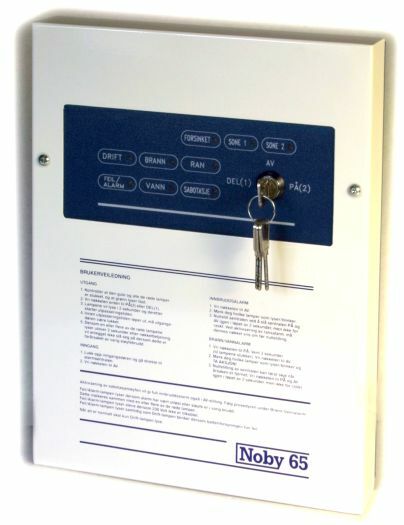 The Noby-65 can also be connected to a suitable control keypad, such as the Nobycode NC-02, to allow remote operation and setting via user code entry. In addition, the steel cabinet is capable of housing one 12 Volt 7 Ampere-hour sealed lead-acid battery to help provide sufficient battery capacity to meet the relevant standards regarding battery standby by times.